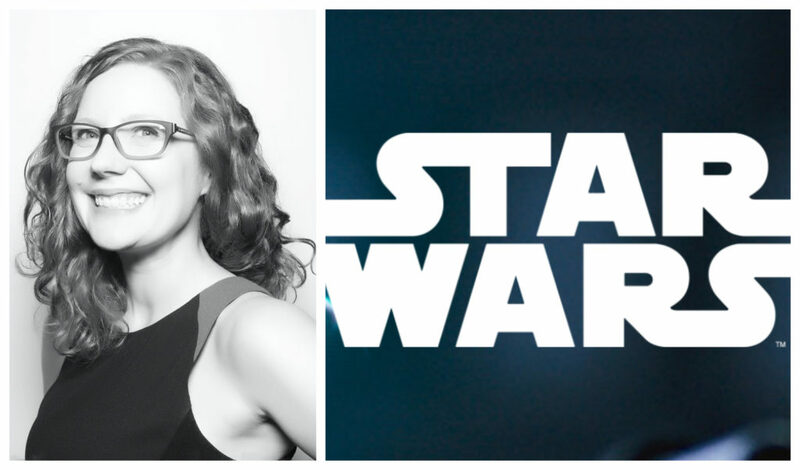 Kristin Baver is the Content Strategist / Associate Editor for StarWars.com. 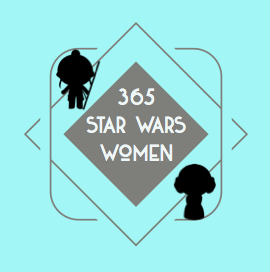 She was kind enough to answer some questions via email for 365 Days of Star Wars Women. It’s hard to pin down because I grew up in a household that was big into science fiction, so my parents naturally introduced me and my sister to Star Trek and Star Wars really early on. I remember being about 3 or 4 and snuggling into my dad’s recliner next to him so we could watch Star Trek: The Next Generation. With Star Wars, it’s such a huge part of pop culture that even before I remember seeing the original trilogy, I know I was aware of characters like Yoda — we had a hand puppet in the house and he showed up in the closet on Muppet Babies. I distinctly remember getting the Power of the Force action figures of Chewbacca and R2-D2 one Christmas, and watching the films on VHS and any time they played on TV, and I was enamored with the galaxy from then on. I should also note that my mother once made me a lovely white gown from a bed sheet and we bought these ridiculous long ropes of hair so that I could do a school presentation dressed as Princess Leia. 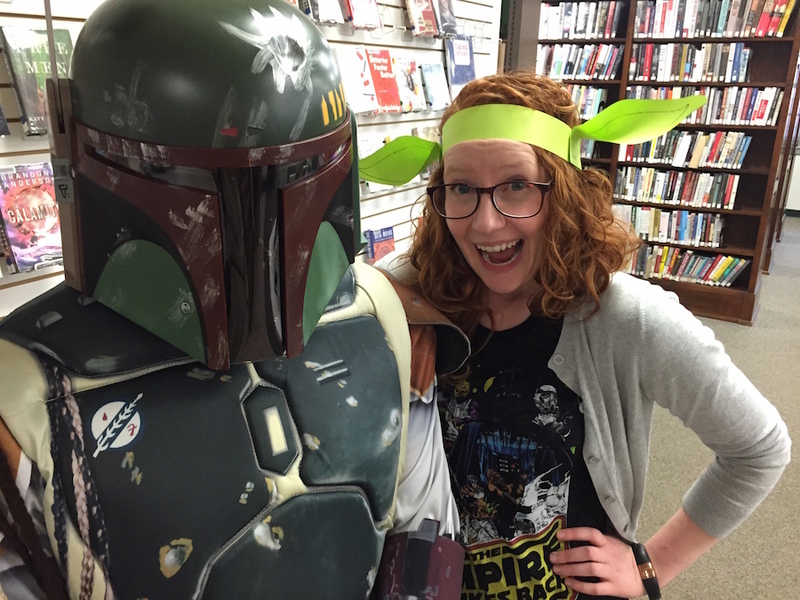 What are some of your favorite Star Wars characters, films, or time periods? I have a theory that the Star Wars that first captures your attention and makes you fall in love with the saga is the one that remains your favorite even as you discover the rest. For me, that was and always shall be The Empire Strikes Back. There’s so much growth for the characters in that film! From the beginning, Leia was smart, assertive, and strong, but she gets to have some more vulnerability and emotion here. Han always had the best one-liners and quips, and so much swagger and boldness, but he also gets to be a little more fallible and kind here. I recently got to see the film performed with a live symphony and it just blew me away how a movie I know so well and have loved so long could still feel so powerful to watch. I’ve always been drawn to the underdog characters, the little guy trying to do what’s right despite the odds, but as the galaxy has expanded, I find I fall in love with each new iteration for different reasons. The prequels are such an important lesson in corruption and betrayal, and the way good intentions can go awry. The sequels have felt like a homecoming of sorts; watching The Force Awakens for the first time made me feel like a kid again in the best way possible and I’m so excited to see the next generation exploring that and discovering it for the first time. And I love the way the standalone films, the animated series and other media like the comic books and novels help to flesh out these smaller corners of the universe. I’m not ashamed to tell you I was tearing up at my desk watching the trailer for The Clone Wars during San Diego Comic-Con. Every time we get more stories in the galaxy I become very aware of how emotionally moving I find all of them to be! 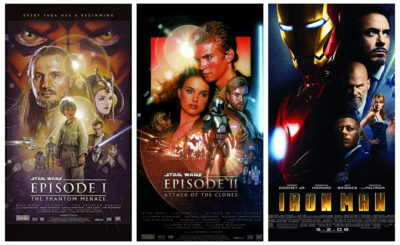 Why do you think Star Wars has remained as popular as it has for so long? The themes are timeless. An epic story of good versus evil will never go out of style! But one of the really ingenious things about Star Wars is the way you get to rediscover new elements and aspects over time. The parts of the story that resonated when I was a kid aren’t necessarily the aspects that I’m thinking about as an adult and I love that! I think, if you’d asked 10-year-old Kristin, I wanted to be like Han. By 15, I would have coveted Padmé’s closet. I can only hope to age well and have a teeny, tiny fraction of Yoda’s wisdom. It’s so rare for a story to be so complex that it truly is for everyone, and Star Wars is that gem that keeps delivering no matter who you are or what stage of life you might be in. Plus, the storytelling is just phenomenal! How long have you been a writer? Before you started with StarWars.com what kinds of writing did you do? I definitely knew I wanted to be a writer when I was in early elementary school and I started writing and illustrating my own stories. Fortunately, my very wise mother (hi, mom!) encouraged me to pursue writing professionally instead of just as a creative outlet. I’ve always been very curious and prone to asking questions, so I studied journalism and just absolutely loved that I could get paid to do what I already enjoyed doing — telling stories and being nosy! For over a decade, I was a reporter at a wonderful daily newspaper in Pennsylvania; I learned so much about interviewing and story structure, I can’t imagine what my writing would look like if I hadn’t had that training ground. I think every writer could really benefit from spending a year working in the news business. You encounter some characters and situations that are truly stranger than fiction, but you also learn that good writing comes from research and reporting and just time spent slogging through the worst writing you’ve done so you can get to some of the best. 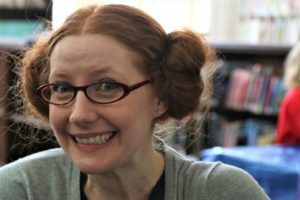 How did you start writing for StarWars.com? Do you remember your first pitch and your first published article? I remember it very well in part because I was utterly convinced that they would never respond! Despite what Obi-Wan says, I think there was definitely some luck and good timing that came into play with me landing the gig as a freelancer for StarWars.com. It was a few months after The Force Awakens and I had this renewed love for Star Wars so I was really eager to get involved writing about it for the site. 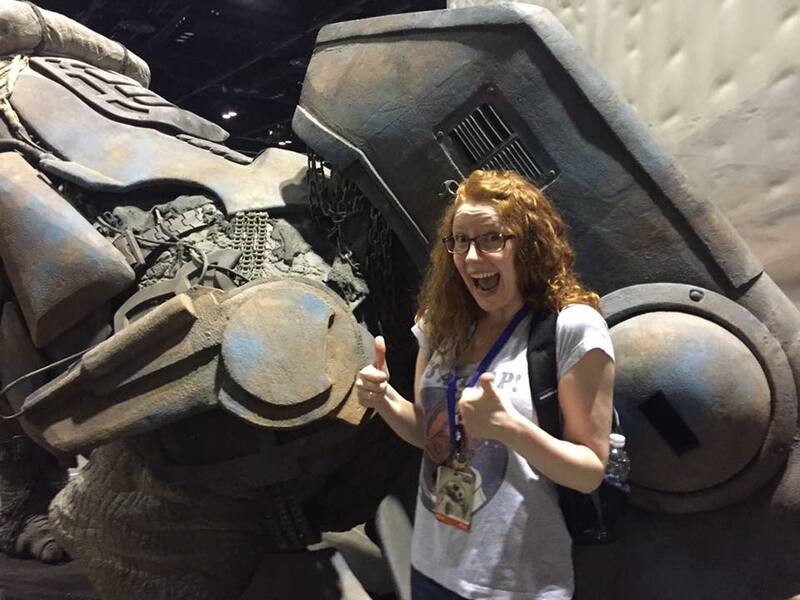 The first story I did was about these amazing fans who built a life-sized luggabeast and it was like everything I had been doing professionally and this universe that I loved personally coalesced into this perfect-for-me job! It became apparent to me from that first article that I wanted to write more about fans and their contributions to the community that has made Star Wars something that’s so beloved for four decades. I was also lucky enough to get to help the StarWars.com team in the field for Star Wars Celebration Orlando last year. My feet were pretty much entirely blisters by the end of the weekend, but I had so much fun covering panels and talking to fans, who were so gracious with their time. Sometimes I also write about characters or themes, I interview designers making really amazing new toys or I make a pit stop at a traveling exhibition on my way to a vacation in Europe, but in almost every story I feel like it comes down to two fans chatting and nerding out. I’m so thankful to be able to play some small part in the whole thing. 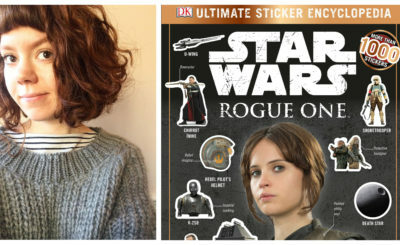 Finally, a use for all that Star Wars trivia knowledge I amassed as a kid! Do you have a favorite article or series you have written for the official site? I’m really proud of Most Impressive Fans! It grew out of this idea that I wanted to spotlight more fans who were creating some really phenomenal passion projects and I consistently find myself just in awe of the things people are capable of creating. 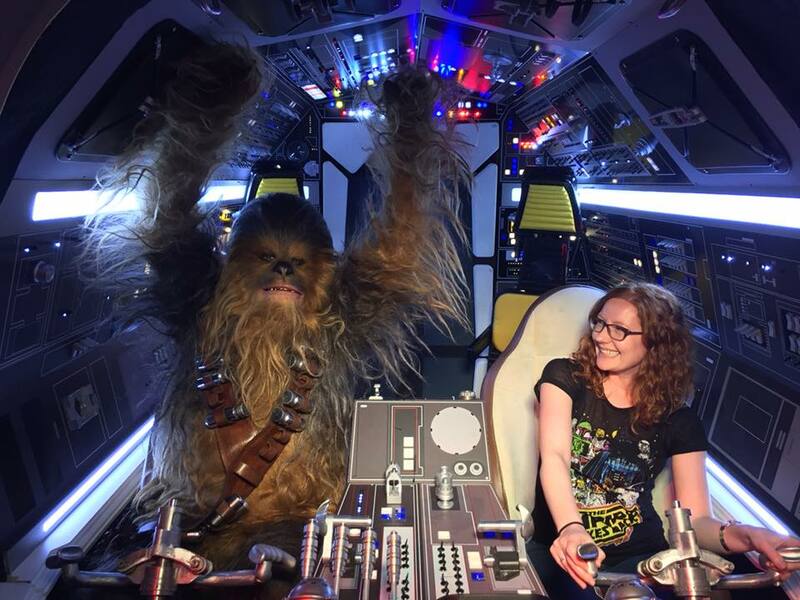 I also love talking to people involved in the process of making Star Wars! After 40 years, the people doing the work today are mostly folks who were fans first. Brian Herring, one of the puppeteers behind BB-8 and many other creatures, was one of the kindest people I’ve had the chance to interview. And James Clyne had so many great anecdotes, we ended up talking for hours and developed a three-part series on his designs for Solo: A Star Wars Story. How did you get to be a contributor for Star Wars Insider and what kinds of articles did you write for them? In sort of a reverse Han Solo, I talked my way into that one. I had a pretty extensive body of writing samples for newspapers, magazines, and websites including StarWars.com when I started pitching the magazine. For a little while I oversaw their Worldwide section, gathering and writing short stories about fans around the world, and sometimes doing calls for art submissions. I did some longer pieces as well, including an interview with The Star Wars Show crew, who later became my regular co-workers! You recently came on as Content Strategist / Associate Editor for StarWars.com. Can you explain what a content strategist does and what an average day looks like for you? It’s amazing to me how similar working in editorial for StarWars.com is to working in a regular newsroom some days! No two days are alike; sometimes my office has taken me to the red carpet to conduct interviews with fans, which is pretty amazing and glamorous, and other days I’m literally sitting on the floor of an airport writing up news from a press conference. Actually, both of those happened in the span of the same week, now that I think of it. I work closely with our senior content strategist Dan Brooks to plan our news calendar, figure out how we can cover Star Wars breaking news or come up with fun features. I spend a lot of days in the office going to meetings and working on the site to prep and edit stories, but my favorite thing is still getting the chance to just talk to people and then figuring out the best way to bring their story to life with the written word. I’m really thankful for the foundation working at a newspaper gave me, not only in the writing and editing, but also in the way I think about the community we serve with the website. Star Wars is for everyone and we want to create a place online where people can come to find articles that entertain and inform them, videos that make them laugh, and the kind of trivia that I would have just absorbed as a younger fan! I saw your name in the credits of the epic 100th episode of The Star Wars Show. What was your contribution to that episode and is it hard to convince your family and friends that you actually get any work done in that office and don’t just have Star Wars parties? Ha! Some of my friends refer to my work now as my “job” whenever they ask about it. And it’s hard to argue with them because I get paid to think about and write about Star Wars and some days to watch Star Wars! How is that real life?! Normally, there’s a whole dedicated crew that puts the show together week in and week out, but for the 100th episode spectacular they needed a few extra hands on deck (and some dancers in red Millennium Falcon shirts). I was a special assistant to our beloved Gonk droid, because walking batteries need a little extra help especially when their power supply is running low on whimsy. If you look really closely, you can see me in a crowd shot cheering Gonk on during a very, very slow footrace! If you could choose a character to star in a Star Wars standalone movie what character would it be and during which time period? I would love to see Sabine and Ahsoka teaming up in a standalone based on the Rebels epilogue! And I adore Admiral Ackbar, so I would definitely watch a whole movie devoted to him and his military career. What person would you have the hardest time holding it together as a Star Wars fan if you ran into them in the halls at Lucasfilm? I like to think I’m pretty good at keeping my cool and being professional (at least on the outside,) but it would be really hard to string together a coherent sentence if I just randomly saw George Lucas by my office. He was one of the many amazing people who I saw at the Solo world premiere, and when I did see him the first thought I had was very C-3PO-like: “Oh! The maker!” Everything Star Wars is today started because he had a story to tell, he had a vision and he found the right creative partners and actors and model makers to bring it to life. It’s truly awe inspiring and that galaxy has been such a gift to so many people. Do you have any advice for people who would like to write about Star Wars on the official site or other media sites? If you want to write in any capacity, spend a year as an ink-stained news reporter. I learned so much about storytelling and gathering information and asking interview questions that has helped me over the years. And, in equal parts, I learned how to not take criticism personally, how not to write a lede, and how not to drag my feet because there was a deadline every single day. I did so many things wrong or backwards or poorly in my early writing career, and that type of learning in invaluable if you want to learn how to do things right. As Yoda says, the greatest teacher, failure is. Also, perseverance is so important. Whatever outlet you want to write for, keep pitching ideas and trying to improve your writing until the editor says yes to one of your stories. And then keep pitching ideas and trying to improve your writing. You’re never done with that part. The longer I write professionally, the more I am painfully aware that I always have more to learn. Much to learn, I still have. 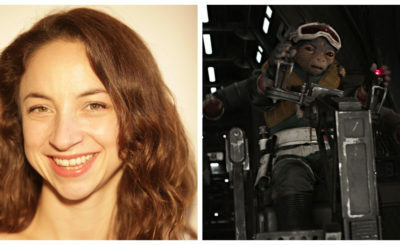 Can you give us hint at what Star Wars fans can look forward to seeing at StarWars.com in the near future? With the big news that The Clone Wars is returning with new episodes, I’m sure you’ll see lots of stories celebrating the series, including a full rewatch of the show. And now that we have casting news about Episode IX, I’m so excited to learn more about the film as we get closer to its premiere! But I would love to hear from fans and readers about what kinds of stories they would like to see on StarWars.com. And if you know any particularly impressive fans, send them my way! You can find Kristin on Twitter @KristinBaver and Instagram @ByKristinBaver.